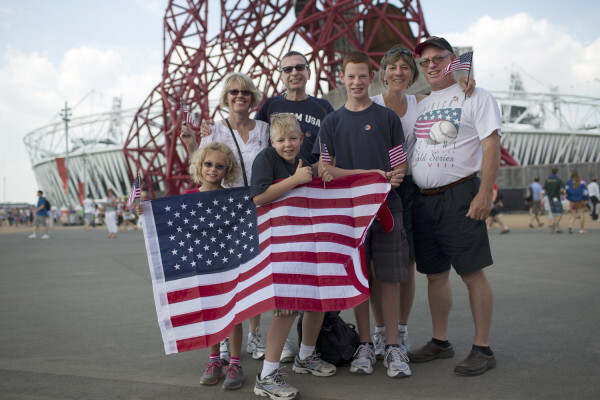 L-R: Gail and Dennis Serwick from Woodbridge, N.J., and their daughter Megan, 7 (front left) and Kim and Rick Van Liew from Randolph, N.J., and their sons Matthew, 11, (front middle) and Russell, 12 (front right), In London's Olympic Park Thursday. 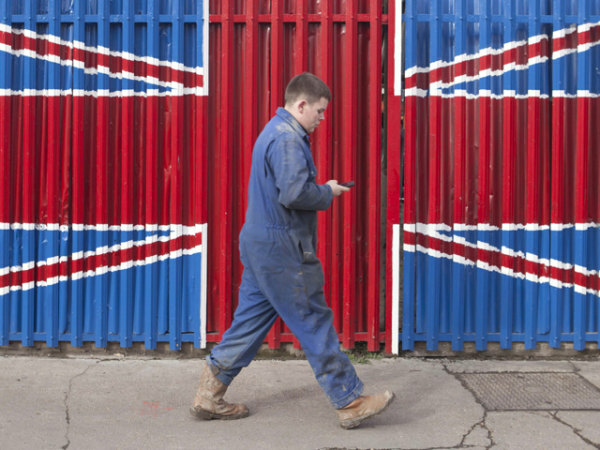 LONDON – A day at the Olympics in one of the most expensive cities on the planet was never going to be cheap. But for a group of sports fans from New Jersey this "once in a lifetime experience" was well worth spending the equivalent of about $1,000 for a family of four. Ticket prices for every event -- including the opening and closing ceremonies -- start at a symbolic GBP 20.12 ($32), but most seats cost considerably more, and getting access to smaller venues such as the 6,000-capacity velodrome has proved tough. “It was so incredibly hard to get tickets,” said Gail Serwick, from Woodbridge, N.J., who eventually managed to secure seven seats in the aquatics center at $110 each thanks to relatives who live in her native Wales. 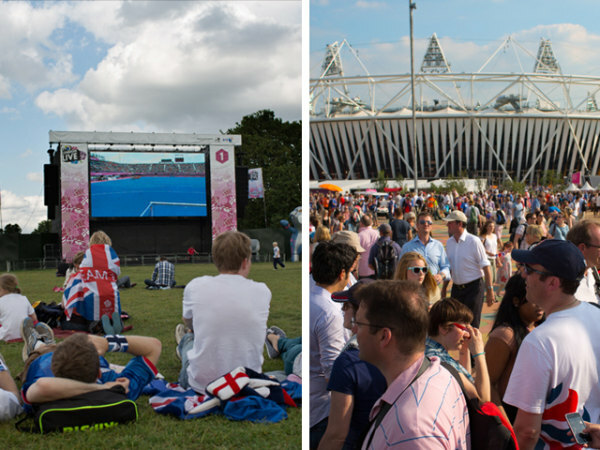 Around London, alternative Olympic viewing sites offer locals and tourists a cheaper, crowd-free version of the Games. Five were for the women’s 10m platform diving finals on Thursday morning, while two were for synchronized swimming in the afternoon. “The allocation on sale in Britain was higher so it was the only real way we could get tickets. We tried everything and got so many rejections before we got these. You could get cheaper but we didn’t want nosebleed seats where you can’t see anything because we wanted it to be a special occasion," Serwick said. She traveled to London with her husband Dennis and daughter Megan, 7, and another family -- Rick and Kim Van Liew and their sons Russell, 12, and Matthew, 11, from Randolph, N.J.
Their Olympic day out started with a shopping blitz for souvenirs and merchandise including London 2012 T-shirts and sweatshirts for the group and family and friends at home. In total, Serwick and Kim Van Liew spent $907 in the official London 2012 store in Hyde Park near their hotel -- easy to do when a T-shirt costs $40. 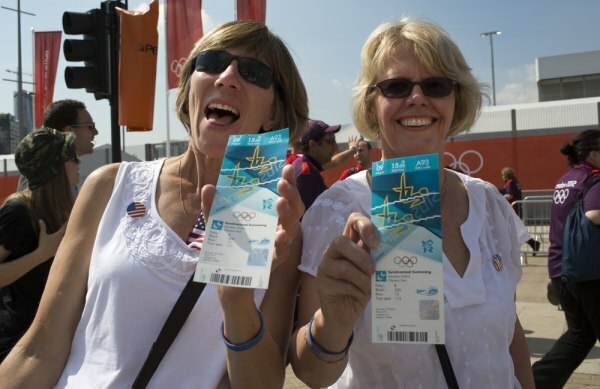 Kim Van Liew and her friend Gail Serwick show off their tickets to synchronized swimming at London's Olympic Park, Thursday. Then there is the cost of food and drink inside the Olympic Park, where sponsors Coca-Cola, McDonald’s and Heineken control the prices. A Big Mac costs $4.20, a Big Mac Meal $6.70 and an individual tub of Caramel ice cream $3.90. For drinks, a 500ml (16.9 fl oz) Coke costs $3.60 while a pint (19.2 fl oz) of Heineken is $7.20. In total, the group spent $93, or $13.40 per head on lunch and snacks while enjoying the sprawling park between their two events. The only cost they didn’t have to worry about was transport: Free one-day Oyster transit cards are included with all tickets. In total, their day at the Olympics cost $1,770 between seven -- equivalent to nearly $253 per head, or about $1,011 for a family of four. So was it worth it? Rick Van Liew said the tickets were equivalent to the price of seats to watch Major League Baseball at the Yankee’s stadium. Indeed, tickets for an October home game against the Boston Red Sox on sale Friday ranged from $38 to $200. “This is a once in a lifetime experience," Gail Serwick said, "and it’s hard to put an exact price on that." Are these German protesters the world's oldest squatters? Race to London's Olympic Park: Fastest way is ...? 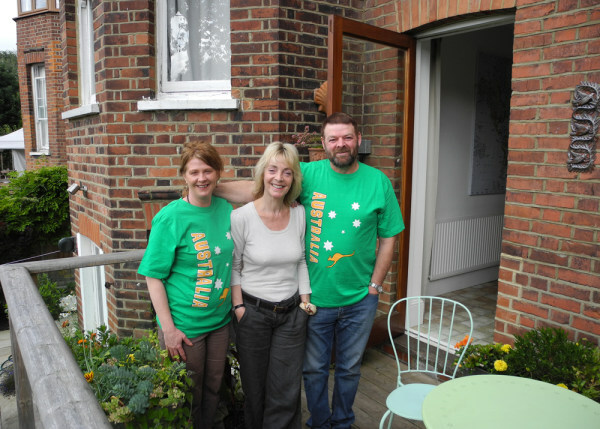 Graham and Delwyn Cure, parents of Australian track cyclist Amy Cure, are staying with Elizabeth Gill, center, at her home in Muswell Hill, North London, during the Olympic Games. LONDON – When one of the most expensive cities in the world hosts the Olympics, high prices for tickets and hotel rooms are no surprise. But Londoners have embraced the spirit of the Games by opening up their own homes free of charge to athletes’ families and spectators from around the world. Dozens of British residents have invited guests to use spare rooms as part of organized homestay schemes, while countless more have offered up their sofas through message boards for budget travelers such as Couchsurfing. For some, it was reports of hotels and homeowners attempting to cash in on the Olympics that motivated them to offer open up their homes. In February, NBCNews.com revealed that landlords in Britain's capital were evicting tenants in order to cash in on the Games by charging tourists many times the usual rent. “I didn’t want the world to come away from London thinking we were only interested in trying to make money from people,” said Liz Gill, who is hosting Graham and Delwyn Cure, from Tasmania, Australia, whose 19-year-old daughter Amy is due to represent her country at the women’s track team cycling later on Friday. “When you visit a country for the first time you take away an impression of the place and the people and when I read all these reports of exorbitant hotel prices I thought it would be such a shame if that’s what Britain was remembered for. We’re delighted to have visitors,” she added. Sofa so good: Couchsurfer Shamey Cramer, left, from Los Angeles, and his host in east London, Emy Ritt. As long ago as February, when the biggest tranche of tickets for London 2012 went on sale, hotel rooms in London had already peaked during Games dates. British consumer organization, Which?, found a double room at the Best Western hotel on Shaftesbury Avenue for Saturday – the night of the men’s 10,000 metres final – was $733 compared to only $435 for a normal Saturday night last month. Gill offered space in her north London home through More Than Gold – a charitable organization originally set up to represent the work of local churches at the 1996 Atlanta Games. “We have only known for a few weeks that Amy was definitely going to be part of the Olympic squad,” said Graham Cure. “There was no doubt we didn’t want to miss our daughter in her first Olympics, but by now air fares were more expensive and we were thinking about where to stay. While athletes’ families are usually given free tickets for events, offers of accommodation are rare. For others, it was not just the price of London hotels but the atmosphere that was unappealing. “I hate soulless and expensive chain hotels,” said Shamey Cramer, a postgraduate student originally from Los Angeles who secured a spare sofa in east London – minutes away from the main Olympic Park - through the Couchsurfing site. A hotel? An archaeology site? Or both? 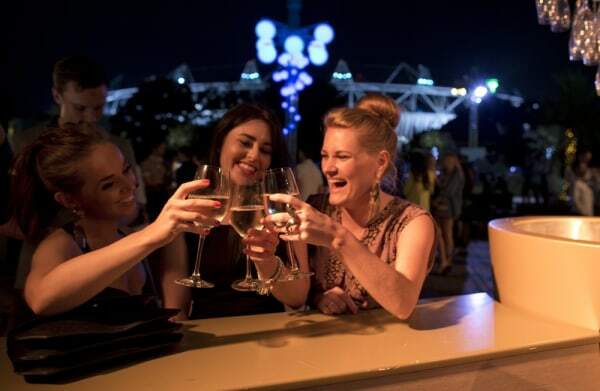 Olympic Stadium can be seen in the background as partygoers watch the opening ceremonies on a massive LCD screen in East London. Updated at 8:45 p.m. ET: STRATFORD, East London – For billions of people watching around the world, Friday night’s 2012 Olympic Games opening ceremony signaled the start of two weeks of sporting excitement. But for nearby residents just outside the main Olympic Park — within earshot of the spectacular show, but separated by 11 miles of electric fence — the celebrations also marked the end of seven years of planning and redevelopment which has transformed the local area and made an impact on many lives. Tens of thousands gathered in parks to watch the ceremony on giant screens, or hosted parties in apartments and backyards in the shadow of the stadium. Cheers erupted when British cycling hero Bradley Wiggins rang the bell to begin the display. “For people living in this area, the Olympics isn’t just about these two weeks — they’ve been living with the anticipation and excitement for years — as well as the noise and disruption,” said Stephen McVeigh, deputy head of residential property at Genesis Housing, whose 700-home development includes a 43-story tower, Stratford Halo, under construction yards from the Games. As McVeigh spoke to NBC News, the Royal Air Force display team — the Red Arrows — roared overhead, coating the urban skyline in red, white and blue trails that drew a huge cheer from nearby streets. Although the tower is unfinished, workers and corporate guests gathered on the 38th floor from where the view included a section inside the stadium. 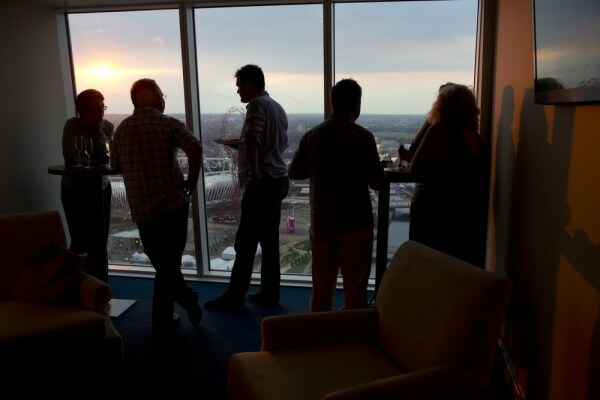 Workers and corporate guests watch the opening ceremonies from the 38th floor of Stratford Halo, a 43 story-housing tower still under development in Stratford, London, only a mile from Olympic Park. 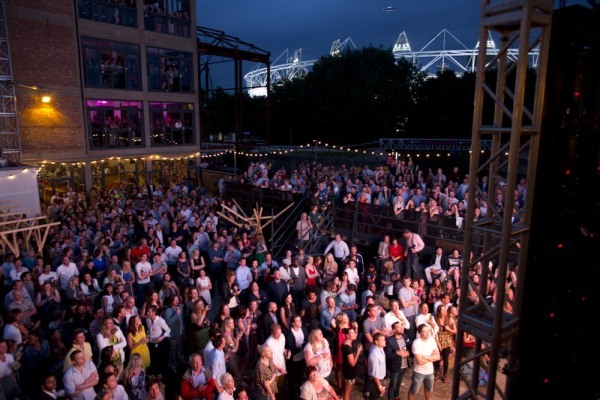 Across the River Lea, southwest of the stadium in an industrial zone that has witnessed decades of decline, one local furniture factory decided to make the most of the event by clearing its workspace and yard and converting them into a giant temporary nightclub and bar complex called Fringe 2012. A bartender pours a customer a glass of wine at one of the many bars in Fringe 2012, a factory turned nightclub just for the Games, on Friday in East London. Inside, with the music from the ceremony drifting across the river, revelers who had paid up to 25 pounds ($39) cheered their favorite points in the ceremony — including the appearance of live cows and comic actor Rowan Atkinson (best known in America as Mr. Bean) — and joined the stadium crowd in singing the National Anthem, "God Save The Queen." When the Olympics and politics collide: Is neutrality just a 'fairy tale'? “We decided this was a better business plan so we applied for a (liquor) license and put a giant screen and turned it into a place for people to feel part of the Olympic experience even if they couldn’t be in the ceremony or get tickets for the events," said Steve Black, whose family has made sofas on the site for generations. 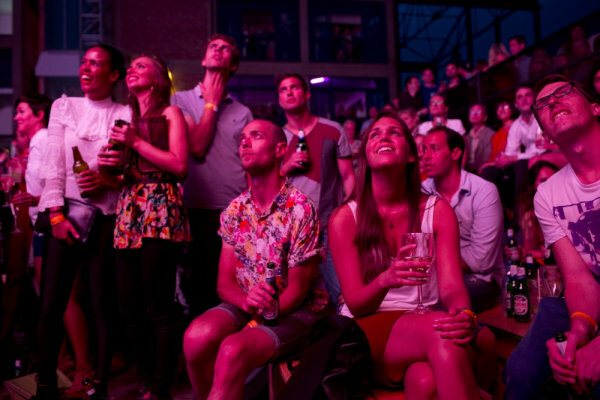 Partygoers watch the opening ceremonies on a massive LCD screen at Fringe 2012. Thousands packed into Victoria Park, about two miles west of the stadium, to watch the ceremony on big screens. There was an ironic cheer when it began to rain, but the best reaction of the night came when a comedy skit depicted The Queen alongside James Bond actor Daniel Craig. A major part of the show was an homage to the U.K.’s National Health Service, with nurses dancing and hospital beds arranged to spell out NHS and GOSH, for Great Ormond Street Hospital. There was applause as performers, many of whom work for the NHS, passed through Stratford subway station still dressed in their stylized uniforms. She added that her mother had been to see a rehearsal. “She was in tears, overwhelmed with what she saw, also that fact she was there and part of it,” Alaart said. Dikaia Chatziefstathiou, an academic and expert on the Olympics at Canterbury Christ Church University in England, was among the dancers for part of the show featuring music from the 1980s and 1990s. Professional opera singer Elinor Jane Moran, 31, from London, was among those dancing to current British hip hop music in the show – something she’d never done before and learned during the rehearsals. She enthusiastically related how she had shaken hands with U.K. hip hop star Dizzee Rascal as he came on stage in an unscripted moment. Spectators were sporting flags from all over the world, from Australia to Brazil, Japan to Canada. Yulia Semakima, 25, from Omsk, in Russia, who is studying law in London, was among those caught up in the mood of the moment. “I’m not a big fan (of the Olympics), but now I feel like I’m becoming more and more enthusiastic about it,” she said, dressed in a Russia shirt and cap. “I think we will be third (in the medal table) after China and then the U.S. I hope we can beat France and Germany,” she added. One Briton who was definitely enjoying the Games was Lucy Chisholm, 44, from Twickenham, London, who was wearing British flags in her hair, on her T-shirt and had one painted on her cheek. “I feel very patriotic at the moment. With everything that’s been going on in Britain, it’s been fantastic. We’ve had the (Queen’s) Jubilee and that really brought people together,” she said. Jamaica supporter Richard Woodburn, 32, from London’s East End, was wearing a Jamaica sports shirt and proudly showed a picture on his cellphone of his house bedecked with Jamaican flags. “They (Jamaica) are going to clean up in the athletics — 100 meters, 200 meters, 400 meters, 400 meters relay, men and women,” he said. Mark Townsend, 46, who was born in Britain, grew up in Canada and whose wife Mariko is from Japan, was similarly upbeat, saying he hoped the Games slogan of “Inspire a Generation” would come true for his children, age 11 and 5. “My 11-year-old daughter is going to play (soccer) for Canada, Japan or Britain,” he said. He said the scouts planned to watch the cycling road race Saturday, with Britain’s Mark Cavendish among the favorites to win. 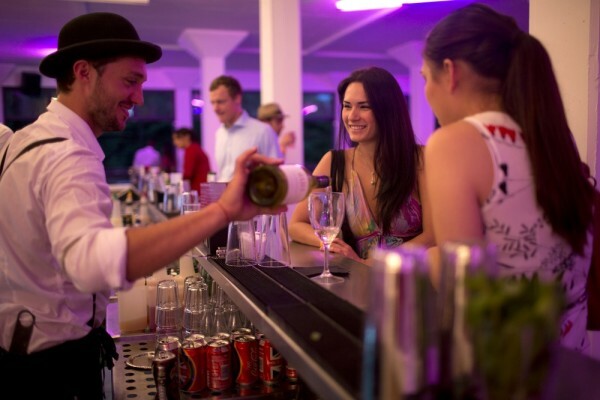 At Forman’s Smokehouse, a family-run fish processing company that was forced to relocate to make way for the Olympic Park, managers transformed the forecourt into a spectacular temporary beach-themed bar complete with beach volleyball court, palm trees and champagne counter. Anna Celeste Walters, left, has a toast with her friends Amy Loudon, center, and Alex Sinclair. They were three of about a thousand people who celebrated the opening ceremonies at Forman's Smokehouse, a family-run fish processing company in East London. When Sir Paul McCartney performed "Hey Jude," the crowd mirrored those inside the stadium by singing along with their hands in the air. Gary Bott, 31, a construction worker, traveled two hours from the city of Cambridge in order to celebrate in London. He was unable to get into the public screening at Victoria Park because it was too crowded. Paco Lima, a 35-year-old soldier from Mexico, was also soaking up the atmosphere at Forman’s — and cheering on his country when Mexican athletes joined the parade. “The ceremony was great — like a Hollywood production,” he said. Among those performing in the spectacular show was dance student Jack Ludwig, 22. He told NBC News before the ceremony began: “I don’t think I’ll ever get to do anything like this in my lifetime again, so to be part of it is incredible. NBC News' Jim Seida contributed to this report. 'Fairy tale': Is the Olympics really neutral? Millionaire medalists: Does the Olympic spirit live on? this may or may not have to do with the article, but i am disappointed that nbc has gone to such great lengths to block U.S. citizens the ability to view the opening ceremonies live. GOP presidential hopeful Mitt Romney sparked a political firestorm during an interview with NBC's Brian Williams, in which he questioned whether London was ready for the Olympics. NBC's Peter Alexander reports. LONDON – The bells were ringing across a green and pleasant Britain on Friday morning to celebrate the start of the Summer Olympics. From Big Ben to the rusty clanger in our old village school, the noise of the bells could be heard for miles. The only other sound you could clearly hear above them was that of crunching metal – the sound of a politician slamming his campaign car into reverse. Republican presidential hopeful Mitt Romney came to the United Kingdom to launch an international charm offensive and ended up offending a nation. TODAY's Matt Lauer and Meredith Vieira discuss the much-anticipated London Olympics Opening Ceremony, including some of the top-secret details that have leaked. On the face of it, his gently expressed doubts to NBC's Brian Williams about Britain's readiness to stage a successful Games were not particularly shocking. Up until a few days ago, we'd been expressing doubts of our own. But now that the Games are officially kicking off, it's party time – and the art of a politician is to judge the mood of the public. And on this Romney – as we say over here – dropped a clanger all of his own. "Mitt the Twit" screamed the headline in the popular tabloid The Sun. "Who invited party-pooper Romney?" asked the Daily Mail. Suddenly, Romney-bashing became a new gold-medal event. At a concert in London's Hyde Park, Mayor Boris Johnson threw Romney's comments right back at him like an Olympic shotput: "There's a guy called Mitt Romney who wants to know if we are ready," he asked the 60,000-strong crowd. To a man, woman and child they shouted back, "Yes we are." From Wimbledon to Wembley Stadium to The Dome, a look at the venues for the 2012 London Olympic Games. British Prime Minister David Cameron was also quick to jump to the country's defense, with a pointed comment sharper than a javelin: "We are holding an Olympic Games in one off the busiest, most active cities in the world. Of course it's easier if you hold an Olympic Games in the middle of nowhere." "Nowhere," of course, meant Salt Lake City. Romney organized the 2002 Winter Olympics there. There were other gaffes: Seemingly forgetting the Labour Party leader Ed Milliband's name and calling him – in a desperate, odd-sounding ad-lib – "Mr. Leader." Spilling the beans about a private meeting he'd had with the ultra-secretive boss of MI6, the British foreign intelligence service. That's one stop short of telling the Russians we're still spying on them. Oh dear. It's all so different from the other presidential hopeful who visited Britain four years ago. On that occasion there was an air of excitement as Barack Obama charmed his way across London, not putting a foot wrong. On this one, it feels like someone has tied Romney's shoelaces together. Candidate Mitt Romney, who was slammed by the British media for comments he made about London's preparedness for the Olympics, now says that "after being here a couple days … I'm absolutely convinced that the people here are ready for the Games." But like all good politicians he bounced back. On NBC's TODAY on Friday morning he was gracious and warm in his support of the London Olympics – sticking to the script this time. He can also take comfort in knowing that back home, there are many who will like him even more, just because the Brits like him less. Ah yes, we may have a special relationship – an "Anglo-Saxon" heritage, as a Romney adviser curiously termed it before the visit. But that doesn't mean we can't throw the pots and pans at each other from time to time. 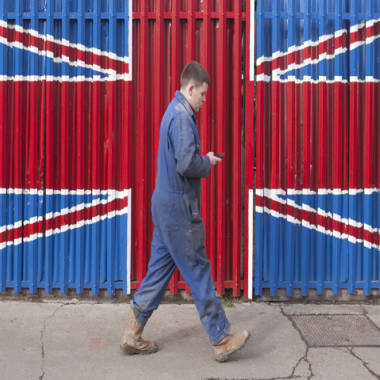 A diverse community in East London will welcome the world to Britain for the 2012 Olympic Games. Meet residents and hear how they feel about having a huge, world stage in their backyard. Some of my best friends own Olympic teams!! Millionaire medalists: Will London 2012 remain true to Olympic spirit? As a member of the U.S. basketball team, Ray Lumpp won gold at the 1948 Olympic Games in London. Lumpp played in an era where amateurism was central to the Olympic ideal. "Even if I just wanted to play professional basketball ... just by saying I wanted to be a pro, I would have been removed," Lumpp said. "The Olympics was supposed to be for fun and games -- no compensation. I was a gold medal Olympic champion, but I owed money." Updated at 10:05 a.m. ET: LONDON — On August 14, 1948, Ray Lumpp stood in London's Wembley Stadium. As "The Star-Spangled Banner" played and "Old Glory" fluttered in the breeze, an Olympic gold medal was placed round his neck. 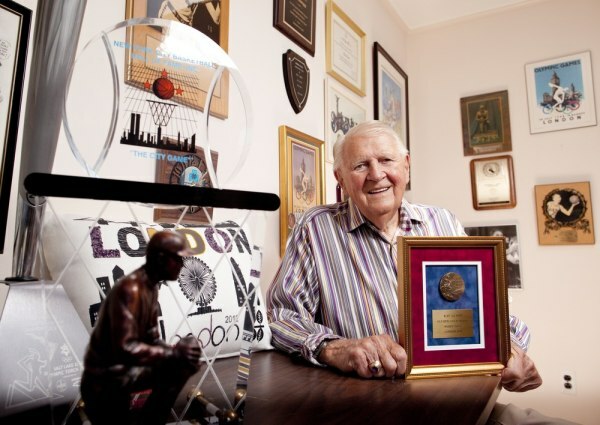 "To be in the Olympics was a dream come true," Lumpp, 89, told NBCNews.com from his Long Island home. "To receive a gold medal … it still shines in my heart." In the aftermath of World War II, parts of London still lay in ruins, food was rationed and the "strictly amateur" athletes were put up in basic accommodation. But "The Austerity Games" remain a special event for people like Lumpp. In sharp contrast to 1948, the London 2012 Olympics has a total budget in excess of $17 billion, a sum greater than the GDP of many of the 200-plus competing nations. About 9 million tickets have been sold and a global TV audience of billions is expected to watch more than 10,000 athletes compete. Amid the glorification of multi-millionaires competing in sports including basketball, tennis and soccer, the sea of corporate sponsorship and fortress-style security — has the Olympic spirit been forgotten? What would previous Olympians make of today’s event? Would the Ancient Greeks — who staged the first Olympic Games in 776 B.C. — give their blessing or call down the wrath of Zeus? And what would the founder of the modern Games, French aristocrat Pierre de Coubertin, make of the demise of the amateur ethos? 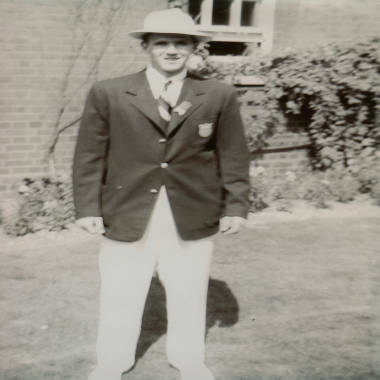 Ray Lumpp, seen here in 1948, is due to travel to London to attend this summer's Olympics. Lumpp played in an era where, unlike today, amateurism was central to the Olympic ideal. "Even if I just wanted to play professional basketball, I would have been removed from the American team — just by saying I wanted to be a pro, I would have been removed," Lumpp told NBCNews.com. "The Olympics was supposed to be for fun and games — no compensation." "I was married with one child and one on the way. I was a gold medal Olympic champion, but I owed money," he said. "You couldn't have sponsors, you couldn't do this, you couldn't do that ... you have to live and you have to eat." After Lumpp returned to the U.S., he signed a professional contract with the New York Knicks and was soon "out of hock." While he said that the acceptance of professionals into the games was a good idea — meaning countries could send their best competitors and a level playing field for all — he added that "sometimes money is too important, you lose the ideals of the Games." The soccer superstar tells Meredith Vieira about his long-time friendships with Princes William and Harry, and explains his fond feelings for Queen Elizabeth II. "The Games are about taking part, peace and understanding, and competing against one another, not fighting … playing against each other for the love of it," he said. "[In 1948] we had great admiration for the British people. Whatever they had, that was it … but whatever they had, they shared it and put on a great Games under the conditions,” he said. Lumpp said the success of the 1948 Games – the first since Munich 1936 in Hitler’s Germany — had been vital. "After that 12-year period when there were no Olympics, it was important, very important, that the next Games be a success because it would affect the future of the Games … because people might say 'it's not worth it,' and it could fade away,” he said. As the U.S. women's soccer team kicked off a game against France, one athlete from Greece was removed after sending what officials are calling a racist tweet. A further warning to athletes: the World Anti-Doping Agency said more than 100 athletes caught doping were sanctioned in the months leading up to the Olympics. NBC's Kevin Tibbles reports. The gap between Games was somewhat longer when Coubertin hit upon the idea of recreating the evemt. The Christian Roman Emperor Theodosius had decreed in 393 A.D. that "pagan cults" such as the Olympic Games would no longer be permitted. Some 1,503 years later, the first modern event was held in Athens. Despite the emphasis on promoting global harmony, Coubertin’s big idea was born out of a war. "It may be a little bit disappointing. You may think it's a product of peace," Dikaia Chatziefstathiou, an expert on the Olympics and an academic at Canterbury Christ Church University in England, told NBCNews.com. France had not long been defeated in the 1870-1871 war against Prussia and there was concern that the country’s youth were "not very active," she said. "The French government worried that the army wasn't strong enough." Coubertin, an expert on education, was brought in to shake things up and, on a fact-finding mission to England, he noted the emphasis on studying Ancient Greece and Rome at the country’s private schools, and was also impressed by the emphasis on sport and "muscular Christianity." This, he thought, could be the answer to France’s diminished military might. The U.S. Olympic committee has asked the Navy SEALs to train athletes with about a dozen teams, including the women's field hockey team and swimmer Michael Phelps. Working with the elite warfare unit pushes the athletes to go beyond what they think they're capable of doing. NBC's Chris Jansing reports. But the late 19th century was also the so-called Age of Optimism when it was hoped that the world could put an end to war, disease and other great scourges. International movements such as the Scouts, the international Esperanto language, the YMCA and others sprang up "all about making society and the world a more peaceful place,” Chatziefstathiou said. "He [Coubertin] came to the idea that actually sport can be used to have a peaceful celebration among the nations because he saw the power of sport,” Chatziefstathiou said. "He said 'Why not use sport and education to actually unite nations around the world?'" The idea caught the world’s imagination, but the first Olympiad in 1896 was a very different games to 2012 or even 1948. There were no women. "He [Coubertin] really didn't want women to sweat. He didn't want women to have any physical exertion," Chatziefstathiou said, explaining this in terms of the social norms of the aristocracy of the time. For the first time ever, all 205 countries competing in the Olympic games are sending female athletes. NBC's Meredith Vieira reports and speaks with sprinter Tahmina Kohistani, the sole woman on Afghanistan's Olympic team. Also, most of the 1896 competitors were members of the upper classes and, if the right sort of person turned up, they just might find themselves allowed to take part. George Stuart Robertson was one such athlete. He wrote an Ancient Greek ode that was recited at the end of the 1896 games and won a bronze medal in the doubles tennis. He also took part in the discus, which was perhaps a mistake, as he is still on record as achieving the worst-ever throw of about 27-and-a-half yards. 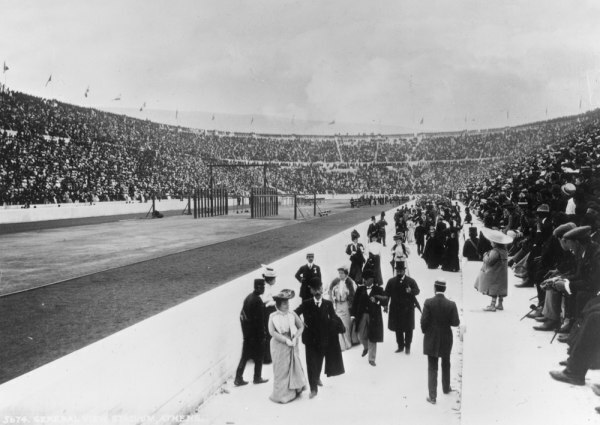 Crowds walk around the Olympic Stadium in Athens during the 1896 Summer Games. However -- in a sign of the Olympics' ability to break barriers — one of the heroes of 1896 was a Greek peasant called Spyros Louis, winner of the marathon. "He became a big symbol of the Games … because without money, without preparation he came and ran in his traditional [Greek] clothing," Chatziefstathiou said. While Coubertin subscribed to amateurism, she said she did not think he would not be appalled by the money in today’s Games. "If he saw that the movement wouldn't really survive without commercialism … I don't think he would be against commercialism with controls," she said. Chatziefstathiou’s interest in the Games extends beyond the purely academic. She will be one of scores of dancers from all over the world in Friday's Opening Ceremony and was enthused by the "joy" among them at a practice held Monday. Oscar-winning director Danny Boyle, who is directing this year's Olympic Opening Ceremony, pulls back the curtain on rehearsals to reveal to Meredith Vieira what viewers can expect, including whether Queen Elizabeth II will make a special appearance. "If Coubertin came back [today], he would absolutely love the spirit of the people, and how many people of all ages, all nationalities are all there and enjoying it, and really actually believing it [the Olympic spirit]," she said. Concerns over corruption, such as betting scandals, might be a worry, but Coubertin would be proud of how "his baby" had grown, she said. "He wouldn't say 'Oh my God, this is a monstrosity' because he was so keen to keep the movement going," Chatziefstathiou said. "I think he would be absolutely over the moon." East London, which will host the Olympic Games, boasts a colorful history. NBC News' Jim Maceda reports. The participation of women, however, might prove too big a step for a man of his background, she suggested. "I don't think he would like this. He would be able to adapt to many things, but this is a spectacle I don't think he would be keen to see." Most Ancient Greeks were similarly against women at the Olympic Games, and to a much greater degree. With the exception of the priestess of Demeter, who oversaw events for religious reasons, any woman found watching the events faced being killed. However, at least one female spectator is said to have survived the experience. Kallipateira, the mother of a boxer, sneaked in dressed as a man to watch her son compete, Armand D’Angour, a fellow and tutor in classics at Jesus College, Oxford University, told NBCNews.com. "Then when her son wins, she jumps up with delight and gives herself away as a woman," he said. Summoned by the judges, she told them how sport was part of her and her family's life, saying "this is who I am." And the judges, D’Angour said, decided to let her off. The idea of female athletes would have been shocking for most Greeks, "apart from one city state, which was Sparta," he said. 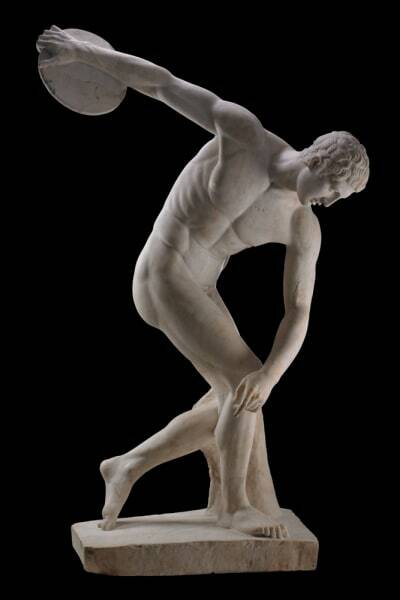 This marble statue of an athlete stooping to throw the discus is one of several Roman copies made of a lost bronze originally crafted in the 5th century BC by the sculptor Myron. In Sparta, women had a degree of equality and were known to be "very sporty." "Spartan women were considered to be women with six-packs — strong, not necessarily beautiful, and quite scary," D’Angour said. However, all Ancient Greeks would have been more in tune with the today’s Olympics when it came to ideas about money. D’Angour said athletes were sponsored by their cities and spent years in training. 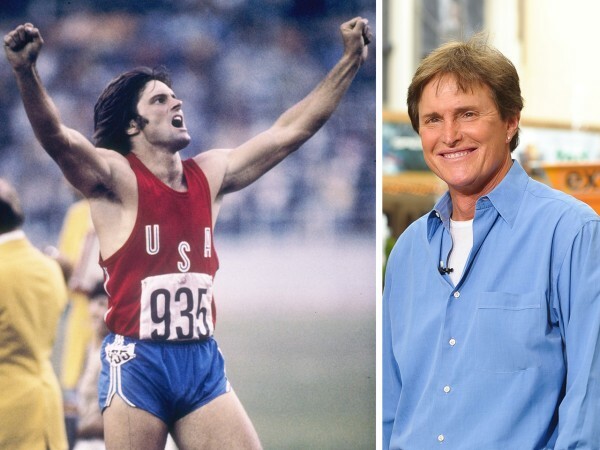 How has life treated the many U.S. Olympians who have dazzled and inspired us over the years? Find out in this handy then-and-now roundup. "And of course if they won, they were feted, celebrated and odes were written for them — an expensive business. They would be fed at public expense for the remainder of their lives. There was a lot of money in it," he added. The amateur ideal or so-called “Corinthian spirit” was “a bit of an invention really,” D’Angour said. Other modern inventions include the Olympic flame — "that’s nothing to do with Ancient Greece, it comes from the idea of the eternal flame in Rome" — and the Olympic rings, he said. D’Angour, author of Ancient Greek odes to the Athens and London Olympics, said Ancient Greeks would be shocked by "the completely irreligious" nature of the modern games. "Zeus, the head of their gods, was very much in the center of the games," he said. A central message was "as great as human beings strive to be, they can never be as great as the gods." 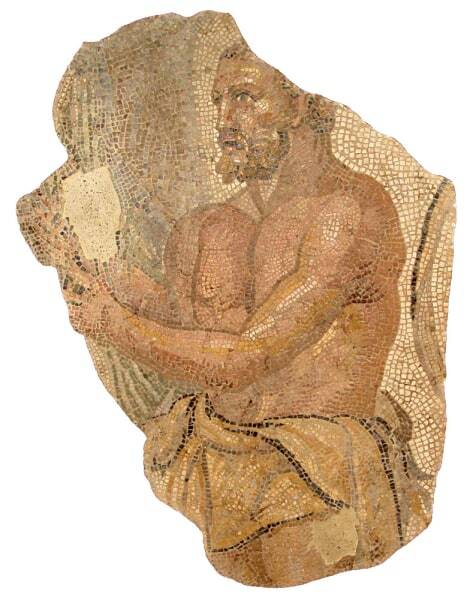 This large mosaic of Hercules, the legendary founder of the Olympic Games and patron of athletes, dates from the Roman period. And they might also be disappointed that the athletes were wearing any clothes. "They competed naked — you’d see a lot of dangly bits. We don’t really know the origins of that. One story says a competitor in a running race tripped over something he was wearing, and after that they decided everyone should go naked," D’Angour said. "I think it was to do with a celebration of the body beautiful. They were keen on the beauty of the bodies, shining, oiled bodies with fantastic musculature and beautiful balance," he said. But overall D'Angour said he thought that any Ancient Greeks transported to London 2012 be pleasantly surprised. "The ambition to do well, the striving to achieve excellence in a sport … Let’s say they got over the fact they were living in a different century, I think they would find it fairly familiar and would be excited," he said. They might be a little bemused by events such as synchronized swimming, he said, but the 100 meters and the world’s fastest man, Usain Bolt, would likely be popular. But even Bolt would be measured against ancient heroes, whose true speed can only be guessed at. "I think what they would feel is 'this chap [Bolt] is a bloody fast runner' but – because they didn’t have records — they would say 'Diagoras,' — who ran in 426 BC — 'was pretty good too, I can tell you,'" D’Angour said. And there might be a few requests for one ancient favorite, chariot racing, to be restored. "That would be fantastic, wouldn’t it?" D’Angour said. "Can you imagine? It'd be like Ben Hur all over again." Updated at 12:11 p.m. ET on July 26: LONDON - The Olympic flame has been carried past famous British landmarks and tourist spots including Queen Elizabeth II's home at Windsor Castle, the Scottish Highlands and the castle in north-east England where the "Harry Potter" movies were filmed. The torch is nearing the end of a winding, U.K.-wide 8,000-mile itinerary that culminates in its arrival at the Olympic Park in Stratford, East London, on July 27 for the ceremony at which the queen will declare the Games open. You can watch NBC video of its progress on the interactive map above. It has already been carried from Land’s End, at the far south-western tip of England, to Wales, Northern Ireland and across to Scotland. It even briefly crossed the border into the Republic of Ireland on its route, which was designed to take it within an hour's journey of 95 percent of Britain's population. 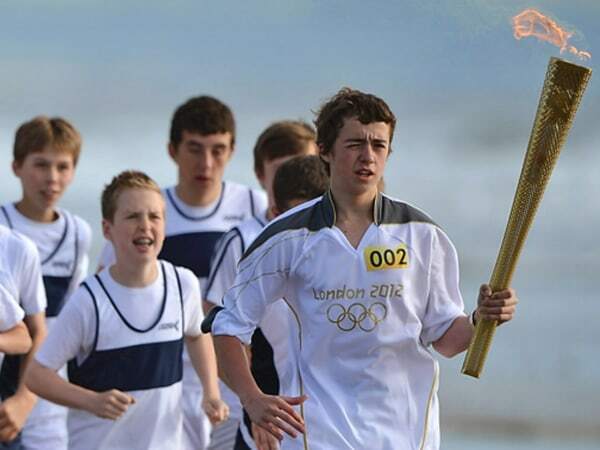 Lit by the sun's rays in Greece, the Olympic torch takes a 70-day, 8,000 mile trip to London for the 2012 summer games. However, some didn’t have to travel anywhere to see it: The queen carried an unopened umbrella as rain-sodden runner Gina Macgregor, 74, took the torch directly to her front door at Windsor Castle, in Berkshire on Day 53 of the relay. Earlier that day, it was held aloft by Roger Bannister, the first runner to smash the four-minute mile in 1954. Bannister, 83, walked 30 yards along the same track in Oxford where he ran the mile in three minutes, 59.4 seconds on May 6, 1954. The torch has seen its fair share of human drama, including a torchbearer in Yorkshire who paused to propose to his girlfriend. If you're heading to the Olympics you'll find yourself in Cockney country, where the accent and slang may not make much sense to the untrained ear. NBC's Chapman Bell reports. And in emotional scenes last month, Lance Bombardier Ben Parkinson -- the most seriously wounded British soldier to survive the war in Afghanistan -- was cheered and applauded by crowds as he bravely carried the flame 300 meters despite his crippling injuries. American stuntman Nick Macomber carried the torch in a special hands-free carrier while using his free hands to control a jet pack on his back when the relay passed Britain’s National Space Centre in Leicester, central England. Diana Gould, the oldest person to carry the Olympic torch, told ITV's Nina Nannar she ready to carry the Olympic flame by walking around her retirement home carrying a two pound weight. I say, jolly good show! But, Roger Bannister? That's Sir Roger Bannister to you, knave! The first Olympic athletes have begun to arrive in London. Tens of thousands of athletes and team officials are expected - and even more spectators. ITV's Katie Razzall reports. Updated at 11:10 a.m. ET: LONDON - Olympic athletes, including some from Team USA, had a bad start to the London Games Monday after bus drivers taking them to the competitors’ village in east London got lost. Kerron Clement, US 400m hurdler and Beijing silver medallist, claimed he spent four hours on a bus after the driver got lost after collecting them from Heathrow airport. Um, so we've been lost on the road for 4hrs. Not a good first impression London. Athletes are sleepy, hungry and need to pee. Could we get to the Olympic Village please. Meanwhile, members of Australian contingent of 30 officials and medical staff had to use their iPhones to direct their bus driver after he also became lost. He said the driver was unable to work the onboard GPS navigation system. “One of the doctors on board got [the GPS system] working for him, but then the Olympic Village hadn't been loaded into the system and everyone was trying to find the name of the street that the village was in. “In the end another physio got out his iPhone and gave directors to the bus driver via his phone." 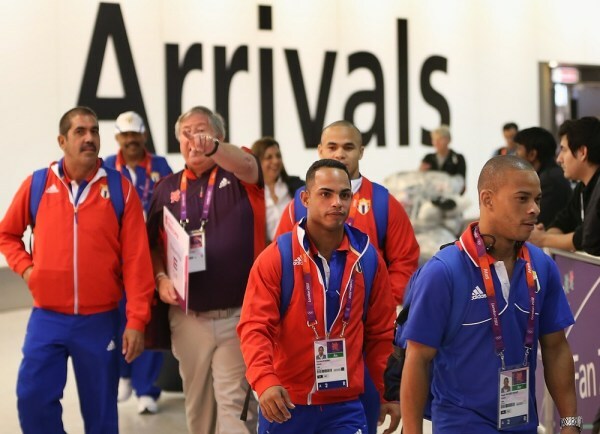 Members of the Cuban Olympic weightlifting team arrive at Heathrow airport on Monday. They were among the first of more than 10,000 athletes and officials due to arrive in Britain this week. Monday was already expected to be the busiest day in the history of London's Heathrow airport, and it was the first major challenge for the road system as the first of several dedicated Olympics traffic lanes also came into operation. Speaking about the lost buses, London Mayor Boris Johnson quipped: "Clearly they would have had even more of an opportunity to see even more of the city than they might otherwise have done." The Daily Telegraph reported that Hugh Robertson, Britain's sports and Olympics minister, apologized to those athletes caught up in the transport problems. He said: "If people have been on buses that have got lost then it is of course regrettable. I am extremely sorry, and clearly the drivers need to know where they are going." The Games are due to begin in 11 days' time, on Friday, July 27. More than 500 Heathrow and Locog volunteers, speaking more than 20 languages between them, were welcoming groups of Olympic athletes and officials from their planes at Heathrow. Approximately 15 percent of baggage on peak days will be large pieces of sporting equipment such as canoes, pole vaults, bikes and javelins and around 1,000 guns and associated ammunition will be arriving with competitors over the coming days. Officials said 236,955 passengers (121,239 arrivals and 115,716 departures) were expected to pass through the airport Monday, compared to 190,000 on an average day. The largest number of arriving athletes is expected on July 24. Dean Brenner, director of the U.S. Olympic sailing team, earlier told ITV News at Heathrow: "We're feeling great, it's great to be in London. "Obviously we've been working a while for this and now it's time for the big test and we are looking forward to getting to [the sailing team base at] Weymouth for a couple more week of training and getting on with the Games." The London 2012 Athletes' Village also officially opens Monday with British athletes competing in diving, equestrian, soccer, shooting and swimming expected to be the first to enter. ITV News is the UK partner of NBC News. Will world's most expensive cable car be ready for Olympics? A handout picture released by the London Organising Committee of the Olympic and Paralympic Games (LOCOG) on Tuesday shows a model of how London's Olympic Stadium would be transformed into a British rural scene for the opening ceremony of the games. LONDON - The Olympic Stadium will be transformed into a British countryside meadow featuring real animals and grass during the opening ceremony, organizers said Tuesday. With only 45 days before the spectacular show, film director and event producer Danny Boyle unveiled his ‘green and pleasant' vision that will open the games to an estimated worldwide television audience of over one billion. More than 10,000 volunteers wearing 23,000 costumes will take part. The ceremony is titled 'Isles of Wonder' and is said to be inspired by Shakespeare's play, The Tempest. 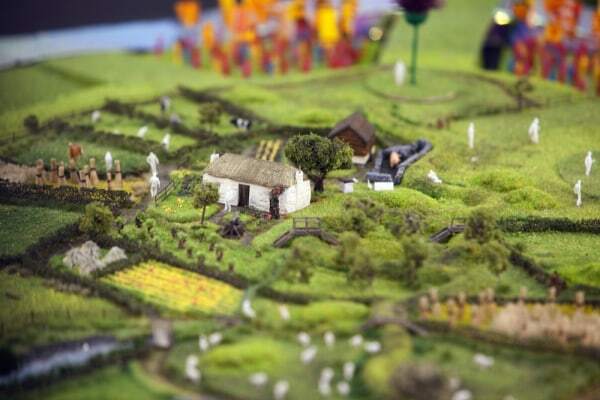 The whole of the field of play in the stadium will be transformed into the rolling British countryside. Each of the four nations will be represented by their national flower: the rose of England, the thistle of Scotland, the daffodil of Wales and the flax from Northern Ireland. Real farmyard animals will graze on the set: 12 horses, 3 cows, 2 goats, 10 chickens, 8 geese, 70 sheep and 3 sheepdogs. The show will feature 12,956 props - over 100 times more than a typical West End musical theater production – and a sound system weighing more than 50 tonnes. Nobody does a ceremony like the British. The transport link between two Olympic venues that might not be ready for the Games. ITN's Simon Harris reports. The world's most expensive cable car is undergoing tests in London – but authorities admit the project, which links two Olympic venues, may not open in time for this summer's Games. The 1,000-yard gondola lift line crosses the River Thames in east London and is planned to be both a commuter route and a tourist attraction. It has been enthusiastically backed by London Mayor Boris Johnson, but opponents point out the scheme will use public money despite a huge $57 million sponsorship deal with Dubai-based Emirates Airlines which means the facility will be officially known as the Emirates Air Line. PhotoBlog: London's new Thames cable car in place - but will it be ready for the Olympics? It will cost up to $95 million in total, with around $20 million coming from local public funds. Transit authority Transport for London (TfL), which will operate the cable car, will only say the project will be open "in the summer," raising the prospect that it will not be ready in time for the London 2012 Games in July. TfL insists the route was never part of the Olympic transport plan. Two 300ft-high pillars will carry more than 30 gondolas across the river from the O2 – the Greenwich concert venue that will host events including the gymnastics and basketball finals – to the Docklands-based ExCel conference center which is being used for boxing, fencing, judo, taekwondo, table tennis, weightlifting and wrestling. The cost of a journey on the Emirates Air Line has not yet been set, but TfL says it will be similar to the frequent Thames River Boat service whose fares are around $8. Passengers will be able to pay with Oyster cards, the pre-payment "smart card" used by millions of Londoners. Although the cost will be significantly higher than the equivalent bus or subway journey, the views from the 10-person gondolas traveling 160 feet above the ground are undoubtedly more appealing. TfL says the system will move 2,000 passengers an hour -- the equivalent capacity of more than 30 buses. What's behind China's crackdown on foreigners? Another step in turning London into a giant theme park. When do they open the giant roller coaster circling Big Ben and the Houses of Parliament water slide? It all seems so...tacky. Australian Olympic shooting gold medalist Russell Mark is set to parade in a lime-green "mankini" made famous by the movie character "Borat" at the opening ceremony of the London Olympics as the penalty for losing a bet. Mark, who won double trap gold at the 1996 Atlanta Games and silver in Sydney, pledged to wear the skimpy swimsuit worn by British comedian Sacha Baron Cohen in the 2006 film if Melbourne-based Carlton lost to St. Kilda in the Australian Football League. Carlton suffered a shock four-goal defeat in the match on Monday night and Mark owned up to making the bet on local radio. "Oh, I must've been intoxicated. Carlton promise so much and just deliver so little. It kills me," the burly 48-year-old said on Tuesday. "Anyway, a lot of people would think a mankini might look better than the uniform they've nominated for us, so I don't know if it's such a bad thing." 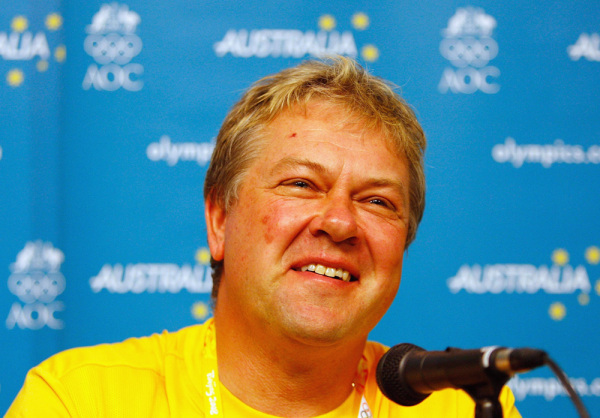 Double trap shooter Russell Mark of Australia, pictured in Beijing in 2008. The one-piece swimsuit would certainly stand out among the other Australian athletes, who will be kitted out in stodgy green blazers and white slacks which fashion critics in Australia described as "retro". An Australian Olympic Committee spokesman recommended Mark keep the mankini in the closet. "Age is the problem here. Russell is no spring chicken, his days of being a model are long gone, and we don't think it would be a good look for the team to have Russell in a mankini," the spokesman told local media. "Besides, this will be his sixth Olympics and he is a chance to be named as flag bearer. Imagine the flag bearer out in front of our team in a mankini. And a big, butch shooter at that. "As we all know the London weather is fickle and we would not want him to catch cold." Good for him -- A bet is a bet. 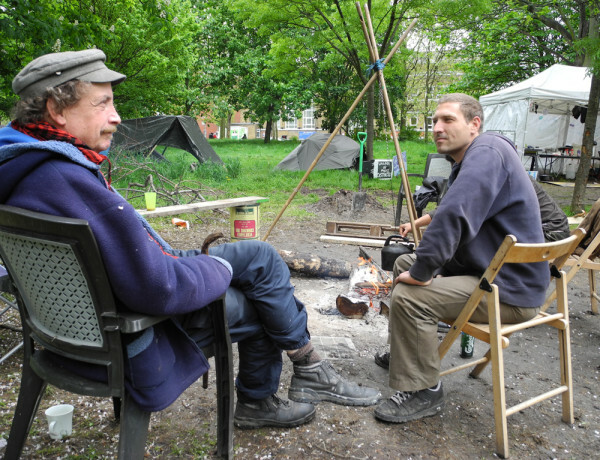 Jim L., left, and other members of the Occupy Mile End protest group at their camp in east London on Thursday. LONDON -- An eviction notice has been served on dozens of Occupy protesters who have set up camp in a park next to Team USA's Olympic track and field training base. About 50 demonstrators are occupying Mile End Park – two miles from the main London 2012 site and next door to a sports stadium where American athletes will prepare for events in July. 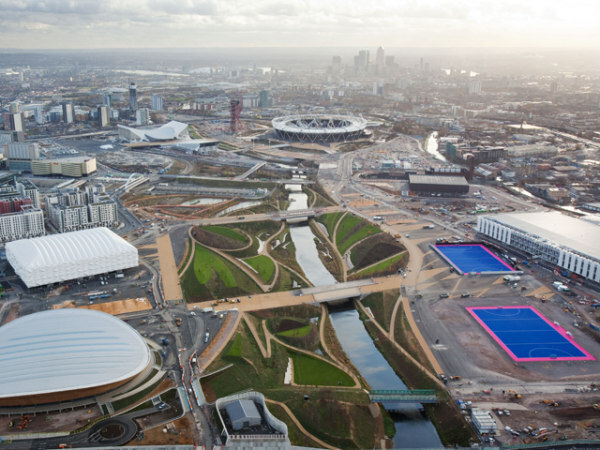 The park is also visible from the priority traffic lanes that will be used to whisk VIPs and other participants from central London to the Olympic Village, which is located to the east of the U.K. capital. The protesters say they are part of the anti-capitalist Occupy movement, which has seen sit-ins and clashes with police in cities including New York, Seattle, Washington, D.C., and Oakland. An Occupy London camp was forcibly removed from the grounds of St Paul's Cathedral by police at the end of February, resulting in 20 arrests. Local authorities have now secured a court order to close down Occupy Mile End, which began five weeks ago and includes about a dozen tents, a campfire and makeshift toilet facilities. Tower Hamlets Borough Council applied for the order following complaints from local residents. The manager of a nearby nature reserve also accused camp members of damaging important trees by taking branches for firewood, according to a report in the East London Advertiser newspaper. One of the protesters, who gave his name as Jim L., told msnbc.com the group had agreed to leave the site voluntarily on Sunday. "This is one of Britain's poorest boroughs and we don't want to take council resources away from things like schools and hospitals so we have agreed to vacate the site without costing the council a penny," he said. Mark Taylor, spokesman for the Mile End Residents' Association, said locals were "looking forward" to a "constructive and companionable relationship with Team USA." He said: "We are very pleased that the council has secured a possession order to reclaim the park for its intended purpose. It's very sad that trees had to be pulled down for firewood and children's activities disrupted before the council acted." Council officials insisted that nobody from the United States Olympic Committee, Team USA or the London 2012 organizers had expressed concern about the Occupy protest on their doorstep. A spokesman for the council told msnbc.com: "The USA track and field team will be training at Mile End Stadium during the Olympic Games. They have funded extensive improvements to the stadium, and will be providing a variety of community benefits including free coaching sessions and opportunities to watch the team training. "We are working with the United States Olympic Committee (USOC) on security issues, understandably these issues are sensitive and therefore we are not able to comment in detail, but we do not anticipate that these will impact on the local community." The council said it would go to the High Court to have the protesters moved if they did not leave the site, which is owned by a private trust on behalf of the council for use as a public park. Jim L. said the Occupy camp would move to a new, unidentified, site on Sunday. He added that there was little chance of protests targeting the Olympic Games. "It would be impossible because of the security, in my own view," he said. "We're not against the Olympics as everybody likes a bit of sport, but I believe it is just one big advertising event for the benefit of corporate sponsors." He said the camp location had been chosen to highlight the issue of poverty in Tower Hamlets and not because of the proximity to Team USA's stadium. American competitors at the Games will have several bases across London for different sports. Other sites include the University of East London campuses in Docklands and Stratford. Langdon School, in the nearby Poplar area, will be home to the Canadian Olympic team. Not sure where these losers are from, but they look about as bright as the protestors in the U.S. Those in the Occupy crowd in U.S. and elsewhere are lazy, entitled, unwashed, and stupid. My advice; grow up, get a job, stop complaining, and start making something of your life. LONDON -- When the 2012 Olympics comes to London this summer, thousands of athletes, coaches, officials and tourists from all over the world will descend upon East London, home to some of the poorest boroughs in Britain’s capital. The factories, warehouses and busy docks that once made it the industrial hub of the city have for decades been morphing into derelict buildings and abandoned scrap heaps as the industries dry up and move overseas – creating the perfect blank canvas for the Olympic sites, the Games’ organizers say. But a vibrant community sprung up in place of the old industrial center, and not everyone is happy about the Olympics becoming a neighbor. Construction workers take a break from their task of building the Olympic site to enjoy a substantial lunch at The Griddler, a local cafe very close to site of the games. Frank and Rosie Aviatti, owners of The Griddler café near the Olympic stadium in Stratford, almost sold their business a few years ago when construction workers closed off part of their road for Olympics-related building projects. “Business went down 90 percent,” Frank Aviatti told msnbc.com. However, other residents and businesses laud the transformative development of the area. Lance Forman, proprietor of H. Forman & Son smoked salmon purveyors, had to move his factory because it was on land that the Olympic organizers wanted for the new stadium. “We did a deal early,” he told msnbc.com, explaining that the 105-year-old company realized it would be a waste of time and money to dispute the compulsory purchase order. They bought land across the river from what is now the Olympic stadium, designed a factory – in just one month – and built it in under a year. To take advantage of what Forman knew was going to be an opportunity for his business, the company opened a restaurant, bar and event space in its new building. Although business suffered at first, Forman is optimistic because of the higher traffic East London is getting because of the Olympics. 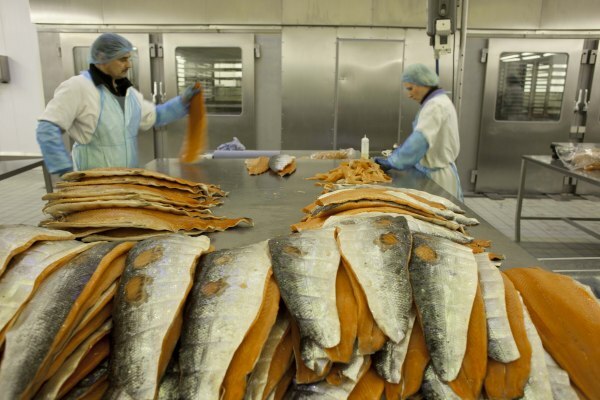 Salmon is sliced and processed at H. Forman and Son, a fourth-generation family business, at its new location directly across the River Lea from the Olympic Stadium. As the Olympics fast approach, photographer Gideon Mendel has sought to capture the diversity of life within one mile of the main Olympic site. Himself an East London resident, Mendel says he is struck by how many different people from different parts of the world live and work in the area – and is intrigued by the idea that the international participants in this summer’s games will be greeted by such an international community. To see some striking images of the people, places and businesses that will be welcoming the world this summer, take a look at the slideshow below.